The Yagyu Shinkage ryu was founded by Sekishusai in the beginning of the Edo period, so there are no techniques implying armour, no tate hiza, and nukitsuke is a cut only on exception. Mostly it's taking a defensive posture. Only if the bad guy insists does he get a beating. At the moment there are about 100-200 students of this ryu in Japan. There are 43 iai kata with no particular order, but 7 are considered basic. Cuts use only the tip, so the cuts never stop (never touch bone) but are part of a flowing movement. One will often shift back near the end of the cut as a defensive move. A Yagyu suburi demonstrated by sensei is making big circles (or figure 8's) from left hasso to right waki to right hasso to left waki, while changing feet. (sorry about the poor description) Cuts are made using the muscles of the back, not the arms. 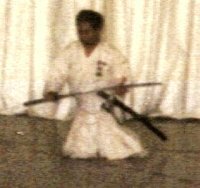 Properly speaking, Shinkage-ryu does not contain iaijutsu techniques, it is strictly a school of hyoho (or heiho, i.e., martial strategy) and kenjutsu. 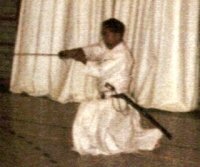 However, the Yagyu Shinkage-ryu line has subsumed the battojutsu of Yagyu Seigo-ryu, a school derived from Seigo-ryu jujutsu (and some jojutsu techniques developed by Yagyu Jubei Mitsutoshi). Also, present-day Yagyu Seigo-ryu battojutsu waza are a reconstruction of the original techniques, probably at the end of the Meiji era, by Yagyu Toshichika (Genshu) and his son, Gencho. Originally, Seigo-ryu was a jujutsu ryu that was practised in the Owari han (domain). The founder was a man named Mizuhaya Chozaemon Nobumasa, who was also involved (perhaps the founder) of Ippon-ryu. It was a jujutsu ryu, but it also included iai and hojojutsu (rope-tying, a common adjunct to jujutsu ryu). Back in the late 1700s, the then-headmaster, Nagaoka Fusashige (Torei), was an assistant instructor (shihan hosa) of the then-head of the Shinkage-ryu. He was a very exceptional man as a scholar, administrator *and* swordsman, and he took voluminous notes on what he'd learned. 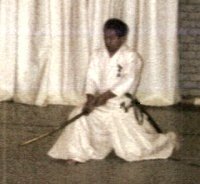 He incorporated Shinkage-ryu principles and training methods into Seigo-ryu and created a number of techniques of sword-drawing, which we refer to over-all as battojutsu. Seated techniques are called iai, the standing techniques are tachi-ai batto. Matsuoka Yoshitaka is 7-dan kyoshi kendo and iaido. I had never even seen this ryu before. In addition I missed the explanations of the first half, so that part is from observation only. You sit down without hakama sabaki, by slightly shifting back the left foot, dropping straight down, and then sliding the left knee next to the right. To rei for start and finish looked the same to me. Right hand holds sword and sageo, thumb(?) on tsuba, place vertical on your right. Then lift horizontally in front of you on shoulder height, tsuka to the left, and put down in front of you like this. Bow with both hands together. Pick up sword and sageo with right hand. Put left thumb in obi before your tanden, then move it to the left and insert the saya. Sageo goes over the back of the saya and is tied on the left front. Big step forward to get up. I didn't remember these names, but sensei kindly handed out a diagram with stick-person drawings (very few sticks in the person unfortunately) for the seven basic kata. Start from seiza. Draw like nukitsuke but at the end the left hand grabs the tsuka too. This is an often returning defensive position. At the same time the left foot is placed forward and to the left and there is a body shift to the left (still on the knees). Without getting up, right foot forward and left back, shift forward and to the right and cut. At the end of the cut you shift backwards. You are now on the left knee. Raise the sword and repeat the cut without moving the body. This is the shinkage chiburi. It's just a kiri oroshi with less speed and power. It doesn't appear in every kata. 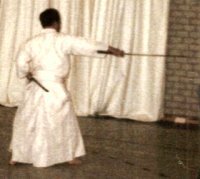 Then there is an often returning guarding position I will call kamaeX in the following (sorry, I don't know its name), the tsuka is moved towards the right hip and the blade tilts so the ha is pointing down to the right. Grab the saya and noto. During noto, the right foot is withdrawn so you end in kiza. Place right hand on the tigh and stand up. Return to starting position. Noto is with the ha pointing up, koiguchi is raised rather high, tsuka goes rather far to the right. Start in seiza. Draw like the previous kata, but standing up with left foot forward. Step forward while lowering the sword to chudan (ha and kissaki are tilted slightly to the right side). After the 3rd step cut kesagiri from the upper left, at the same time slide forward and drop to the knee. An allowed variant is an extra step forward during the cut. Noto. Rise from seiza and draw, stand in defensive posture with left foot forward. Step forward with right foot and cut while dropping on the knee and shifting back. 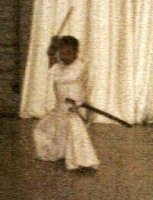 Withdraw the right foot and slide back until you are on the right knee with left foot forward, while raising the sword. Repeat the cut (chiburi) without shifting the body. "kamaeX" and noto. From seiza slide the right foot far forward and cut horizontally very close to the ground, bending forward. (the left knee turns outward wile doing this) Sit straight, arm and cut while shifting forward. 'kamaeX' and noto. From seiza come up into sonkyo, lean back to evade a cut, and draw upward in gyaku kesa. Pull the right foot back far and take hasso (sort of) Left hand now grabs the tsuka too, cut diagonal and the right foot steps next to the left in sonkyo and in the same action pull the left foot back far at the end of the cut. Repeat the cut without moving. 'kamaeX' and noto. You free a passing horse from its rider in this scenario. 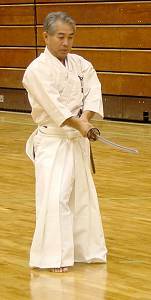 Start standing, draw and left foot takes small step forward, hips turn to the right, and deflect the opponent's cut with the sword (ha pointing right, kissaki forward and left), left hand still holding the saya. Make an oblique cut to the left, a bit like ryuto, but higher, on shoulder height, while at the same time exchanging the position of the feet. Lower the sword a bit, step back far with the right foot, 'kamaeX' and noto. Left foot goes back next to the right. One step to the left. 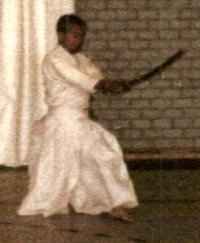 Start standing, like kesagiri but the draw (gyaku kesa) ends at shoulder height and immediately step forward with the left foot while the left hand goes to the tsuka to a low defensive posture (the kissaki is higher than your hands). Right foot steps forward and cut and slide back at the end of the cut. Pull right foot back far. 'kamaeX' and noto. Start standing. Slide right foot forward and lower the body, keeping the back straight. Continue as in hirakinuki. Start standing. Four steps, look back over left shoulder, turn clockwise and draw nukitsuke (1 hand this time) in a wide half circle. Left foot steps forward and cut the wrist with both hands, right foot steps forward and cut kesa from top right. Slide forward and tsuki. Turn around and wakigamae, take 2 small slides forward, then a big slide and kesa cut from top left and at once shift backwards and to the right. 'kamaeX' and noto. You are grabbed by the lapels from seiza. Draw to the right and place left hand under the sword, ha pointing up. Place the sword against the opponent's upper arms, left foot steps forward and you turn to the right, throwing the opponent. Keep the sword very low, pushing with the left hand. Raise and cut immediately. The left hands slides over the mune to its place on the tsuka to save time while raising the sword. During the cut you slide forward or backward according to where teki is rolling himself, to escape or a desparate attack.